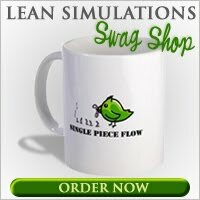 About 2 weeks ago I posted a video of a lean simulation using a paper airplane folding process. 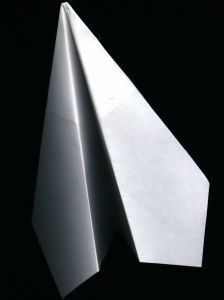 Far from unique, making paper airplanes is a very common technique to teach lean processes. Paper is cheap and available. Folding is easy. Look on youtube and you'll find tons of lean paper airplane videos. I've posted links to a few in the past. What I liked about the last lean game I posted, was how they used scissors to add an extra step to the process. Introducing a tool creates a different type of work technique, which is more common in the real world. How often do we have a process where each step is a variation of the previous step? Not likely. In most manufacturing processes, we have different machines that do different things for a reason. Welding, driving screws, assembling components of differing geometry and complexity, paint, glue, curing. The list could go on forever. That's why having a lean simulation with differing process steps is a better way to simulate a real process, in my opinion. I looked long and hard for paper airplane folding instructions that incorporated a scissor cut and came up empty handed. So I decided to examine the video closely and come up with the steps myself. After watching the video replay, the decision is final. It's good! If you can't see the embedded page above, you can download the file directly from Slideshare. Has anyone else used a paper airplane simulation for lean training? What paper airplane model did you use? Great! Wonderful add to the previous post. This simulation's exercise fits perfectly in the learning of the principles. I use it. Good stuff. Glad you shared this.